As a child I spent countless hours in rapture observing color filter through glass marbles. The love and obsession with light has persisted throughout my life and became a primary force in my work as a photographer. 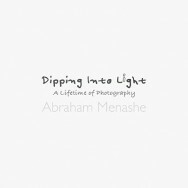 Dipping Into Light, gathers under one cover selected photographs from twelve projects, made between 1975 and 2005. The title is inspired by the poet Mary Oliver, who portrays prayer as, a dipping of oneself toward the light 1. Biblical text informs us that darkness preceded light and was the catalyst to its birth. When God began to create heaven and earth, darkness was already upon the face of the deep. … And God said, Let there be light: and there was light (KJV, Genesis 1:2-3). These dual forces—the darkness and the light, have complementary tasks. Both are portals for redemption, and both are responsible for the propagation of life. Each possesses unique gifts as well risks—the dark can terrify and torment, and too much light can make us blind. Yet, from a mystical perspective, God saw the light, that it was good: and God divided the light from the darkness (Gen. 1:4). We cannot articulate gratitude for light, this act of divine mercy—this Lamp of God 2, without fully embracing the fruits in the belly of the deep. Darkness holds stars in her bosom and is the very womb where life and creativity incubate. Night after night, darkness enters the sunflower, and in turn its blooms offer gold to the dawn. The Dark offers its own incandescence, joining lovers so their wings can beat like oars of light. From inception, light was freely poured upon the void, as seed for clarity. Since then, light has followed mankind, a promise kept, bearing the wisdom of countless generations who found their way by it. A lifeline to higher ground, light uplifts and invites all that is possible. It returns daily to reassure us not to despair; we wait in the dark, we wait in faith, and night eventually turns into day. Light, sanctified as good, keeps on breaking. When light begins to stream through the windowpanes of our lives, something hopeful rises in us—this is goodness defining itself. Light comes because it has to. I made it my life’s work to bear witness to light’s promise, and trust that the photographs from this modest retrospective will provide the reader with pleasure and solace, like those I experienced from the glass marbles of my childhood. With this publication I begin in awe and with profound joy to fulfill another calling. After three decades of photography, I now shift my primary focus to poetry. As I tap on the keyboard, as was with each release of the camera’s shutter, I continue my journey mining for precious light. As we find our way (in whatever capacity) into light’s dominion, a domain whose inherent nature is one of optimism, generosity and revelation, we release the nectar contained within Psalm 34, a psalm that says: Taste and See that God is Good. We live by the light we make. Perhaps all God wants from us is to continue the work S/He started, which is to dip into light and make the next moment of life luminous. 1Mary Oliver, Winter Hours (Houghton Mifflin, 1999), 108. 2Freema Gottlieb, The Lamp of God (Jason Aronson, 1989). 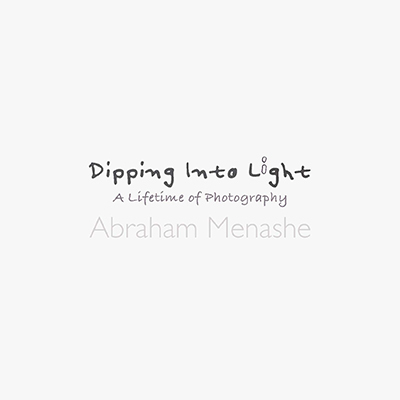 Dipping Into Light; A Lifetime of Photography by Abraham Menashe, available from iTunes.